ATian has designed this backup camera for use in almost any vehicle, including trucks, RVs, campers and cars. It comes with a sleek design, durable construction and a 5” LCD monitor that is capable of displaying crisp, clear images in almost any lighting. You will appreciate its versatility, especially if you plan on using it in more than one vehicle, and this backup camera is also incredibly easy to use. It should be noted that this backup camera system from Atian is only designed to be mounted vertically, and not in a horizontal position. While this does not affect the amazing picture quality or the camera’s performance, and a mount for horizontal mounting can be purchased separately, this is something that should be considered depending on your vehicle. Featuring a durable, waterproof construction and versatile design, it is easy to see why this is often considered the best wireless backup camera. The sturdy construction ensures that the camera can withstand torrential downpours without any problems and still transmit incredibly clear images without any problems. It also comes in a sleek and stylish design that fits easily on most vehicles, and won’t appear bulky when it is mounted on the back. Its contemporary design also makes it a popular choice with consumers. It’s versatility allows you to use it with most vehicles, including cars and large RVs. 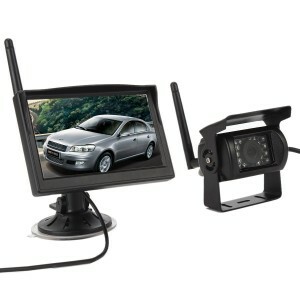 With the 5” LCD monitor you will be able to clearly see any obstacles behind or beside your vehicle. It comes with a convenient suction cup mount so you can easily attach it to your dash for quick viewing when you are backing up. This also makes moving the monitor to another vehicle quick and easy. The controls for the monitor are placed in the back, but are still easy to reach when adjustments to the picture quality need to be made. Capable of displaying amazing picture quality during the day or at night, parking and backing up your large recreational vehicle just got easier with this camera system. With the 3.6mm lens you never have to worry about dangerous blind spots when you are parking or backing up. The 2.4Ghz camera will capture high resolution images and instantly transmit each one to the 5” monitor. The wide angle lens ensures that everything around the vehicle can be clearly seen, and this system also comes with infrared night vision capabilities. Clearly see obstacles in any lighting, even in pitch black parking lots. 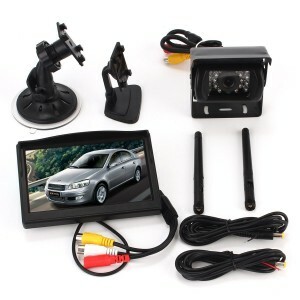 You will also appreciate knowing that everything you need to mount this wireless backup camera is included. The vertical mount is designed to attach discretely to the back of your vehicle, and the included power cables simply hook up to the battery. This system also comes with handy instructions, and if you need additional assistance with installation the friendly customer service department is also ready to answer any questions you might have.